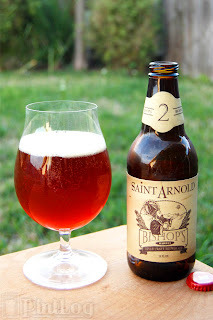 Time for a fresh old Saint Arnold beer, as we have a new Bishop's Barrel release to review. Bishop's Barrel is Saint Arnold's new experimental barrel-aged series, and the second installment just dropped. I was a big fan of the first release, so I've been looking forward to trying this one. Luckily for me, it was released on President's Day and I had the day off, so I braved the elements and waited again outside Petrol Station here in Houston with a rowdy crew of beer geeks and was able to score a few bottles to bring home. This time around, we have Saint Arnold's Christmas Ale (an Old Ale) aged with cherries in Chardonnay barrels. It was brewed in November 2011, racked that December, and finally bottled earlier this month (February 2013). 54 barrels were aged, yielding 1,146 cases of finished product. When it came time to bottle, the brewers discovered that two of the barrels had taken on Brettanomyces wild yeast character, while another two barrels had taken on sour lactic bacteria character. Instead of dumping these barrels, after testing they were added to the final blend, and will hopefully add a little funk to the proceedings. [L]ight malt up front, chardonnay in the middle and finishes try with a distinct tartness. The cherry throughout is a light note, never dominating. A funky barrel aged beer from my hometown? Let's get to it! Appearance: A hazy red-orange body with bright orange highlights. Up top, a half a finger of whitish head burns out almost instantly, leaving the faintest ring around the edge and no lacing. Aroma: Sweet, tart, musty juicy cherries over biscuity malt and mild barrel character. Taste: A mix of tart, sweet, and juicy cherries, white wine, caramel malt, vanilla and oak from the barrels, and just a hint of spicy booze. There’s a lot going on here, but everything is balanced rather nicely. Juicy cherry and biscuity malt in the finish. Mouthfeel: Medium bodied with velvety-smooth medium carbonation and a drying finish. Drinkability: Goes back about as you’d expect given the style and alcohol content. Verdict: Bishop’s Barrel 2 is an interesting and thoroughly enjoyable beer. There’s less barrel character than the last release, but it’s still all rather solid and a total departure from the base Christmas Ale. I was hoping for a bit more funk and/or sour character, but when am I not?